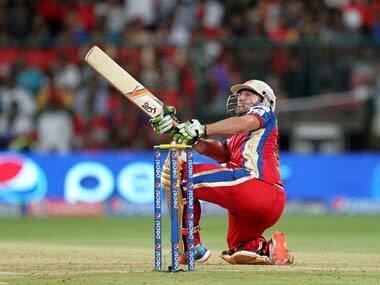 Live scores and updates of IPL 7 match between Rajasthan Royals and Kolkata Knight Riders. Rajasthan Royals lock horns with Kolkata Knight Riders at Sardar Patel Stadium, Motera, Ahmedabad. The match starts at 4 pm IST. Follow this link for live scores and updates. FirstpostIrfan Pathan bowled a tight final over but with only 4 needed, Bangalore would not be denied. After the match was over, the ever-gracious Steyn went over and shared a hug with his international team-mate. FirstpostJust try it because this isn’t something you want to regret later. To have so much power waste away in the dug-out is almost criminal. FirstpostPatel, who returned with figures of 1/29 from his four overs yesterday, said he didn't feel the pressure while coming out to bat in the final over after Mitchell Starc's dismissal. Coming to today's match, RR go into the match high on confidence having won three matches in a row. KKR, on the other hand, haven't had best of times and would look to get back to winning ways after losing three matches in a row. The last time these two teams met they produced a Super Over thriller!!!!! 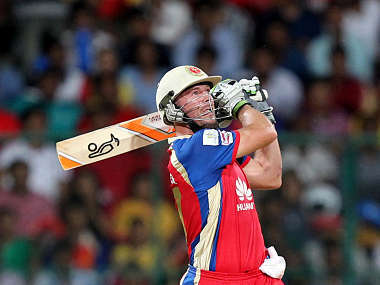 Birthday boy James Faulkner was the hero of the match and Steven Smith calmly and cleverly scored the winning runs for RR. KKR have won the toss and elected to field. Gambhir says that the wicket looks good and won't change much. Watson says that they were anyway looking to bat first. 5 singles off the Shakib over. FOUR! Brilliant shot! A touch full outside off, Samson slices it over point for a boundary. Good comeback from Russell. Bowls a slower one outside off, Samson looks to steer but misses. 8 runs off the over. RR 71/1 after 9 overs. It's the strategic time-out! Both the batsmen are content at picking up singles. In the air but safe. Full on off, Karun gets down for a slog sweep but gets a top edge which falls short of the fine leg fielder. Just five runs off the Shakib over. Ryan ten Doeschate into the attack now. Samson backs away but ten Doeschate bowlers it slower and a tad wide outside off, Samson is forced to guide it to short third man for a single. Ah... Length delivery outside off, Karun goes for a reverse paddle but misses. Full on the pads, Karun flicks it uppishly over mid-wicket for a couple. A yorker to end the over, Karun can't do much but just dig it back to the bowler. Just 5 runs off the over. A slower delivery to start off with. Samson waits and looks to steer but misses. In the air...but safe! Short on off, Samson is late onto his pull and ends up miscuing it straight back. It goes on the bounce to the fielder. SIX! This might release some pressure! Low full toss on the pads, Karun just flicks it over the deep square leg fielder. Fullish outside off, Karun drives it powerfully through point for a couple to end the over. 11 runs off the Yadav over. RR 92/1 after 12 overs. Brilliant stop, Karun cuts it powerfully to backward point where the fielder dives and makes the stop. Just a single. FOUR! Good shot to end the over! It's slower on middle and leg, Karun swipes it behind square leg for a boundary. 9 runs off the 13th over. RR 101/1! Shane Watson strides out to the middle. Narine back on. This will be a good contest - Watson vs Narine! FOUR! Edgy! Samson comes down the track, gives himself room for a cut but gets an outside edge wide of the short third man fielder for a streaky boundary. This time he thumps it through point for a couple. Samson looks to loft this one out of the park but is done in by the flight, ends up mistiming it to deep mid-wicket for a couple. 10 runs off the Narine over. A good one for RR! SIX! Welcome back into the attack Mr. Vinay Kumar! Full outside off, Watson just lofts it over long on. FOUR! Lovely placement! Low full toss outside off, Watson leans forward and drives it uppishly through extra cover. 10 off 2! Very full outside off, Watson reaches out for it and squeezes it to deep cover for a single.